"Grapevines on Rocks" is finished and on the wall for evaluation. So far I am very pleased with it. The past few weeks have been very dry and warm here in La Crosee and I have been doing outside work getting the yard and watergarden ready for winter. The waterlily leaves have been removed, the bridge that spans the narrow part of the watergarden has been primed and repainted, some of the water hyacinths have been removed. The vegetable garden has been mostly cleared out except for the cabbages that haven't grown much and the onions that I started from seed this spring, I separated and replanted. Next year they should yield bulbs. My latest drawing is based on photographs I took in the marsh last month. The shadows cast by this lacy leaf on the bridge deck are very interesting. And somewhat complicated to do. "Shadow Lace", 11.5" x 18", colored pencil on primed paper. In this drawing I brushed the blue shadows with odorless paint thinned and covered with more blue to get the shadows dark enough. On the leaf I scraped out the highlights, the primed surface made this easy to do. Carol, wonderful works! 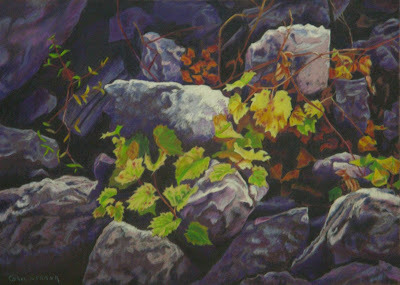 I love both, "Grapevines on Rocks" & "Shadow Lace".